We’ve been good girls and boys all year long, and at times we thought we’d never get our sweet reward. But at long, long last, strawberries have made their magical springtime comeback! Whether you pick-your-own berries or just grab up a bucketful, celebrate the sweet return of strawberries with this cake … the ultimate reward. Grease and flour your choice of cake pan(s); preheat oven to 325 degrees F.
Sift flour into bowl. Add baking powder, baking soda and salt, and mix. In a separate bowl, cream butter and sugar. Beat with electric mixer for 3 minutes, scraping sides of bowl. Add eggs, one at a time. Mix sour cream, vanilla, crushed strawberries, and red food color, if using. Add flour mixture to creamed mixture, alternating with strawberry mixture. Beat for 2 minutes, scraping sides of bowl. Pour into prepared pan(s) and bake for 30 to 40 minutes, depending on cake pan size, or until cake tests done. To make the strawberry mini-cakes shown, first prepare the Fresh Summer Strawberry Cake. After the cake has cooled, place in a food processor and pulse 10 to 15 times until the cake is reduced to crumbs. Using your hands, form cake into the shape of strawberries. Place on waxed paper. Insert lollipop sticks into the ends. Place in freezer for at least 20 minutes. Melt candy coating or white chocolate (colored red) in microwave. Hold the cake pop by the stick and dip into the chocolate. Place cakes on waxed paper and allow to dry completely. Melt both white chocolate and milk chocolate in microwave. Dip again in either of the chocolates. 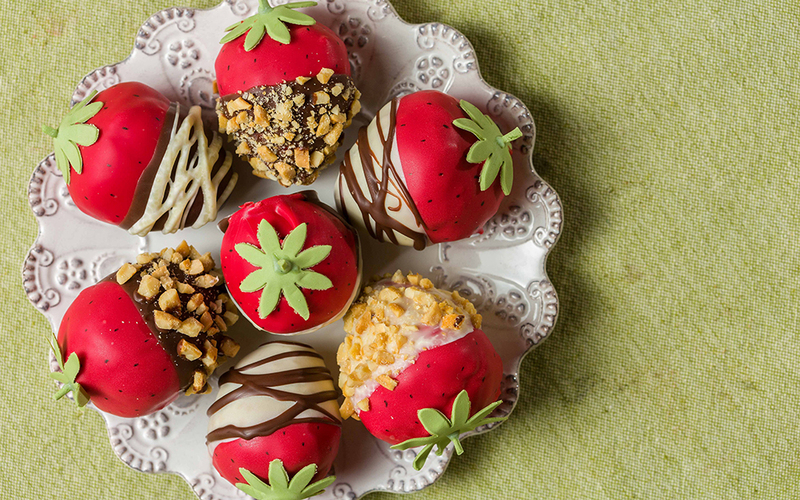 After the chocolate has dried, decorate with drizzled chocolate. If adding nuts, sprinkle before chocolate sets. Take the stick out and cover the hole with a fondant leaf and stem. If not using fondant, a green Tootsie Roll softened and shaped will work, too. Notes: Candy coating can be purchased in the baking section of the grocery store, or at a craft store, in an array of colors. Follow package directions for melting. Fondant can be purchased at a craft store and tinted to desired color.